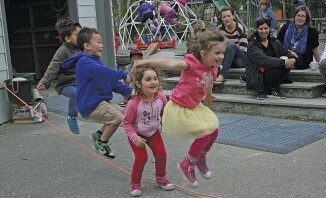 Otaki Kindergarten children are champions at skipping. They blitzed their target by more than 1500 jumps during their Jump Rope for Heart day. The kindergarten’s teachers had set a target of 2000 jumps throughout the day and by 2pm they had amassed an amazing 3503 jumps! They had passed the target of 2000 jumps well before 11.45 when they had already completed 2583 jumps over the rope. The children were able to come and go throughout the day to have another jump, with each tally recorded, while an adult turned the rope for them. Top kindy jumpers were Chase Reid, with 264 jumps completed during the day and Charlotte Jansen with 212. During the day all 42 four-year-olds, teachers, parents and older siblings were joined by 15 new entrants from Otaki School as well as teacher Elaine Houston, who managed over 100 jumps, Waitohu School’s Robyn Dean jumped over the turning rope 79 times and former kindy pupil, Lili-Rose Gilbertson, who had just started school added about 15 to the total. Other skipping supporters included Kapiti District Librarian, Dominique Ware and Joseph Te Wiata from Body and Soul Gym. There was a sausage sizzle to keep up the children’s stamina and they received sponsorship from Body and Soul Gym and Paetata Farm Ltd.